The Irish War of Independence took place during the years of 1919 – 1921. In December of 1921 the signing of the Anglo-Irish Treaty in December between the Irish and British government concluded the Irish war for independence. The nationalist population of Ireland had mostly turned against the British by the year 1918. This was inevitable due the aftermath of the 1916 Easter Rising when the British resorted to punitive actions against known Irish Republicans. Nationalists, of all hues, were horrified by the vengeful executions of the Republican leaders. Plus, with the British government’s cover-up of the murders of pacifist Francis Sheehy-Skeffington , two pro-British journalists, T. Dickson and Patrick MacIntyre, a youth and a republican activist Richard O’ Carroll. These murders had been committed by Capt. J. Bowen Colthurst of the Royal Irish Rifles. Anti-British feelings were also exacerbated by the reports of atrocities committed by members of the South Staffordshire Regiment in the King during the 1916 Rising. These feelings were further inflamed by the attempt to bring in conscription when the Germans began their Spring offensive. It was no wonder then, that in the November 1918 general election, the people of Ireland voted en mass for Sinn Féin, giving them 73 seats out of 105. Unionists won 22 plus 3 for labour Unionists and 1 independent Unionist. The rest of the seats were won by 6 Nationalists. The victorious Sinn Féin party immediately refused to take part in the Westminster parliament. The did however, set up the first Dáil Éireann, meeting for the first time on 21st January 1919 in the Mansion House, Dublin. This Dáil reaffirmed the 1916 Proclamation of Independence. They also reconstituted the Irish Volunteer Movement into the Irish Republican Army. On that very same day the first act of war was committed when an IRA unit operating at Soloheadbeg in County Tipperary attacked and killed two RIC men escorting explosives. The unit was led by Seán Treacy and Dan Breen, both of whom were to become famous guerilla fighters during the on-coming struggle. As the year progressed there was an escalation of military action against the British administration and its mainly Catholic, armed police force, the RIC. Barracks were attacked throughout the country in a quest to obtain arms. RIC personnel were isolated from the community at large and a magistrate was killed in County Mayo. At the same time there was the determined bid to build a state within a state as Sinn Féin set up an apparatus to wrest control of the country from the British operating their own courts etc. Initially, the people were opposed to the violence whilst supporting the establishment of the new state, but, as ever, the British reaction was punitive and heavy-hand in the extreme. Workers began to strike in Dublin, Limerick and elsewhere. Train drivers refused to carry British Army personnel and shops refused to serve RIC men. In the north of the country, as ever, anti- Catholic pogroms were launched in Belfast by unionist gunmen. The IRA, led by Michael Collins, was to develop an excellent intelligence service, reaching into the very core of British Authority in Dublin Castle. Indeed, by using his spies, Collins was able to identify and eliminate the RIC detective murder squad known as the G-men. In retaliation the British Army started to imprison people on suspicion and without trial. Ireland was in a bad way by the late 1920’s. IRA flying columns (bands of up to 100 men) were operating in many areas. The British, were persuaded by Winston Churchill to establish a force of approximately 10,000 ex-army personnel to augment the RIC. This force, under the command of General Frank Crozier, was to become known as the Black and Tans. They were a brutal band who, given a free-hand by the Lloyd George, went on to terrorise and murder many people, burn homes, villages towns and even the centre of Cork city. Their viciousness tarnished Britain’s reputation all over the world. Even many within Britain were vexed by their behaviour. 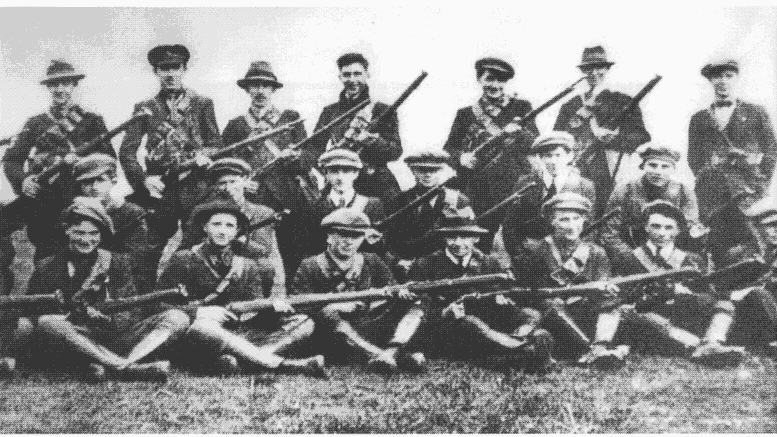 The Black & Tans in Ireland achieved very little except to galvanize Irish resistance to Britain and in reaction, IRA activity increased. In November 1920, Collins issued orders to eliminate a British espionage unit of 14 men working in Dublin. In retaliation British soldiers opened fire at a football match in Croke Park killing 12 innocent people known as Bloody Sunday of 1920. In December of 1920 the Government of Ireland act was signed with the formation of Northern Ireland in 1921. By mid 1921, the British morale was at its lowest. World opinion was against them, their powerful forces in Ireland could not defeat the IRA, a much smaller and poorly armed army of mostly part-time activists. The IRA were also exhausted, they were short on arms and ammunition but had a very effective propaganda machine and so on 11th July 1921 both sides called a truce and both sides were to enter into negotiations that would result in the Anglo-Irish Treaty being signed. A History of Ireland in 250 Episodes. By Jonathan Bardon. Gill & Macmillan. Dublin 2009. Modern Ireland 1600-1972. By R.F.Foster. Penguin Books. London 1988. The War of Independence. By Dr. Fearghal McGarry School of History and Anthropology. Queen’s University Belfast.